standards used for calibration and performance verification. The HI88713 meets and exceeds the requirements of the ISO 7027 Method for turbidimetric measurements. 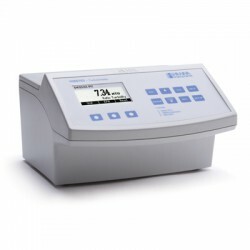 The HI88713 Precision ISO Turbidity Benchtop Meter is specially designed for water quality measurements, providing reliable and accurate readings, even within low turbidity ranges. The instrument is based on a state-of-the-art optical system which guarantees accurate results, assures long term stability, and minimizes stray light and color interferences. 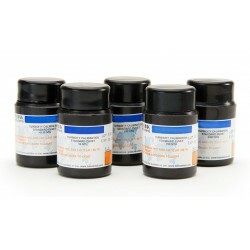 Periodic calibration with the supplied standards compensates for any variations in intensity of the tungsten lamp. 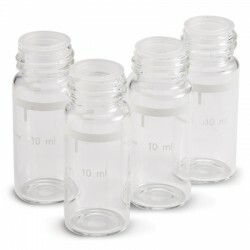 The 25 mm round cuvettes composed of special optical glass guarantee the repeatability of turbidity measurements. 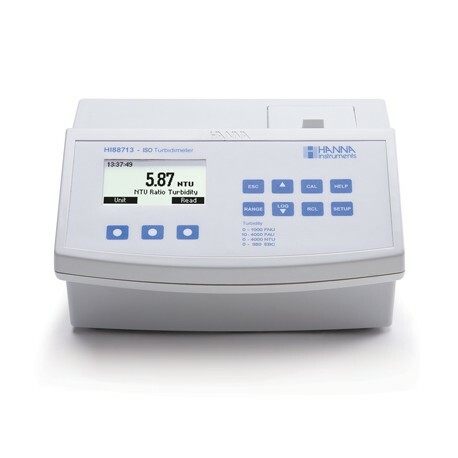 Four Measurement Modes - The HI88713 features four options for turbidity measurement: FNU (Formazin Nephelometric Units), FAU (Formazin Attenuation Units), and NTU (Nephelometric Turbidity Units) ratio and non-ratio mode. Turbidity ranges for each mode are 0.00 to 1000 FNU, 10.0 to 4000 FAU, 0.00 to 4000 NTU (ratio mode), and 0.00 to 1000 NTU (non-ratio mode). 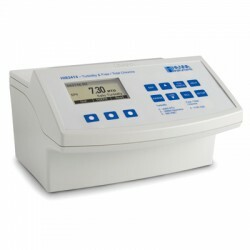 Multiple Turbidity Units of Measure - Turbidity can be read as Formazin Nephelometric Units (FNU), Formazin Attenuation Units (FAU), European Brewing Convention units (EBC), and Nephelometric Turbidity Units (NTU). ISO Compliant - The HI88713 meets and exceeds the requirements of ISO 7027 method for turbidity measurements by use of an infrared LED light source. 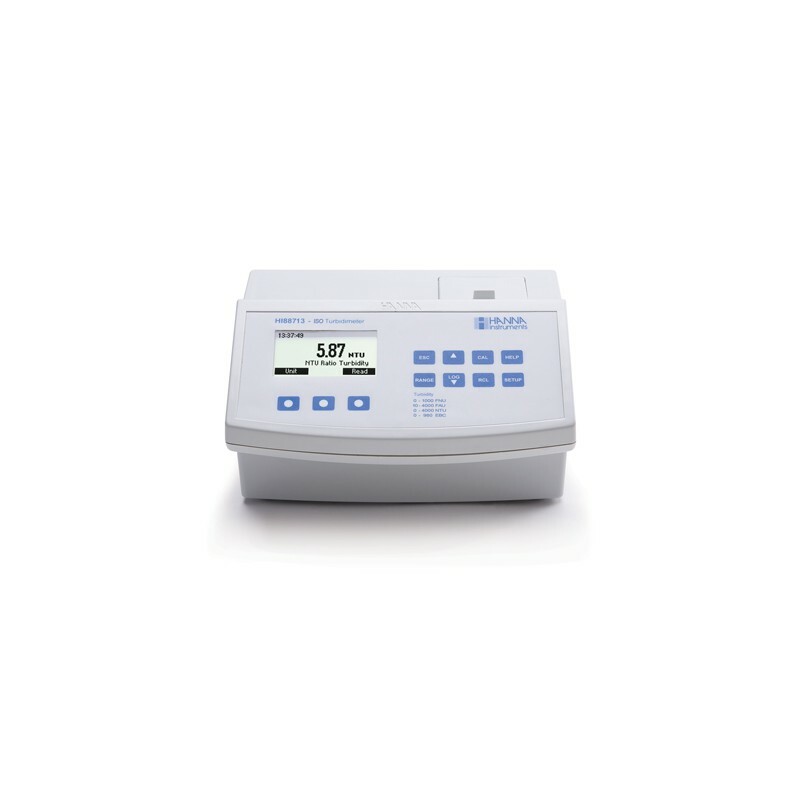 Calibration - The HI88713 has a powerful calibration function that compensates for variation in light intensity. 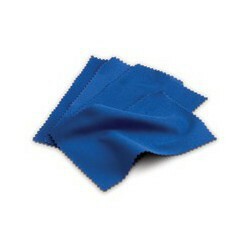 The calibration can be done using the supplied calibration solutions or user-prepared standards. A two, three, four, or five-point turbidity calibration can be performed by using the supplied (<0.10, 15, 100, 750 FNU, and 2000 NTU) standards. Calibration points can be modified if user-prepared standards are used. AMCO AEPA-1 Primary Turbidity Standard - The AMCO AEPA-1 supplied standards are recognized as a primary standard by the USEPA. These non-toxic standards are made of styrene divinylbenzene polymer spheres that are uniform in size and density. The standards are reusable and stable with a long shelf life. GLP Data - The HI88713 features complete GLP (Good Laboratory Practice) functions that allow traceability of the calibration conditions. Data includes calibration points, date, and time. Data Logging - Up to 200 measurements can be stored in the internal memory and recalled at any time. 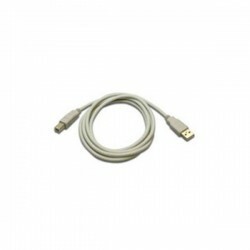 Data Transfer - For further storage or analysis options, logged data can be downloaded to a Windows compatible PC using the USB port and the HI92000 software. Tutorial Mode - The unique tutorial mode provides additional information to help the user during measurements. When enabled, the instrument displays explanations and a confirmation button when a preparation or other operation has to be performed. Contextual Help - Contextual help is always available through a dedicated HELP button. Clear tutorial messages and directions are available on-screen to quickly and easily guide users through setup and calibration. The help information displayed is relative to the setting/option being viewed. Backlit Graphic LCD Display - A graphic LCD display provides an easy to understand, user-friendly interface. All messages are in plain text making them easy to read. There shall be no divergence from parallelism of the incident radiation and any convergence shall not exceed 1.5o. The measuring angle, theta, between the optical axis of the incident radiation and that of the diffused radiation shall be 90o +/- 2.5o. The aperture angle should be between 20o and 30o in the water sample. There shall be no divergence from parallelism of the incident radiation and any convergence shall not exceed 2.5o. The measuring angle of the incident radiation and that of the diffuse radiation shall be 0o +/- 2.5o. The aperture angle should be between 10o and 20o in the water sample. The HI88713 meets and exceeds the meter criteria specied by ISO 7027. 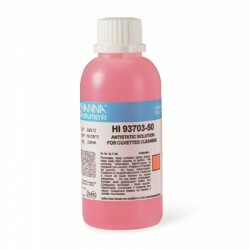 HI 88713-01 (115V) and HI 88713-02 (230V) are supplied with sample cuvettes and caps (6), calibration cuvettes, silicone oil, tissue for wiping cuvettes, power adapter and instruction manual.